First a disclosure- I am an unabashed fan of Dr. Wendy Sue Swanson, aka Seattle Mama Doc. I have long followed her blog and twitter feed and so appreciate her work. A pediatrician and mom, she writes clear, evidence-based blog posts in an open and transparent manner. She has an unmatched ability to break down emerging science around child health into relatable, practical tips. 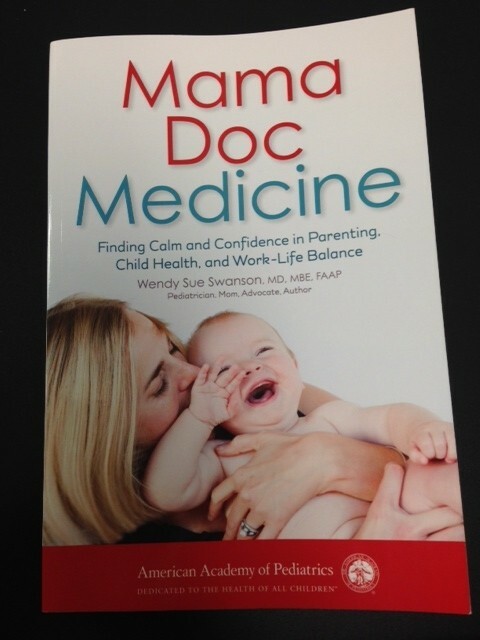 I’m excited to report that her book, Mama Doc Medicine, combines many of her best blog posts with new information creating a fantastic new resource for parents and all who care for kids. Mama Doc Medicine is divided into four sections (Prevention, Social-Emotional Support, Immunizations, and Work-Life Balance/Mothering) and each of these includes short, pithy chapters well suited to the stolen moments of time we tend to have as parents. It was a great read cover to cover, but it certainly wouldn’t have to be read this way. This is a book one could easily pick up and read for 5-10 minutes on a topic that you are worried about, finding answers to those late night questions quickly and easily. It is obviously a book written for the digital age parent (by a very digitally savvy pediatrician) with helpful infographics and links to websites with further information. My favorite section from a pediatrician perspective is that on immunizations. Dr. Swanson has long been an important public voice and advocate around childhood immunization. Here she succinctly overviews the strong evidence for childhood immunizations, while at the same time discussing how past experience and emotion play a part in each family’s experience of vaccinating their child. She then provides more in depth information for many of the essential child immunizations. Dr. Swanson manages to do all of this with a clear, kind voice that is often lacking in the public discourse around vaccines. This section in particular is a must read for all parents and pediatricians. But perhaps my favorite section as a mom is the last- the section on work-life balance/mothering. This may (definitely!) say something about where I am in life right now. It may also be that I so relate to Dr. Swanson’s perspective because we are both pediatrician-moms working full-time while raising little boys. Whatever the reasons, I find her thoughts on work-life balance to be so refreshingly honest and full of common sense. Dr. Swanson’s subtitle is “Finding Calm and Confidence in Parenting, Child Health, and Work-Life Balance” and remarkably (unlike many other parenting books) I did feel more calm for having read this book. I came away with renewed belief that, with a few important exceptions, our child’s health and well being is most impacted by us loving them the best way we know how. We all likely know this instinctively. But having it reinforced in such a lovely way is perhaps the best reason to read Mama Doc Medicine. This entry was posted in Book Review, Immunizations, Parenting and tagged Mama Doc Medicine, Seattle Mama Doc, Wendy Sue Swanson by My Two Hats. Bookmark the permalink.